There are 67 counties in Pennsylvania: Outline Map of the Counties of Pennsylvania. 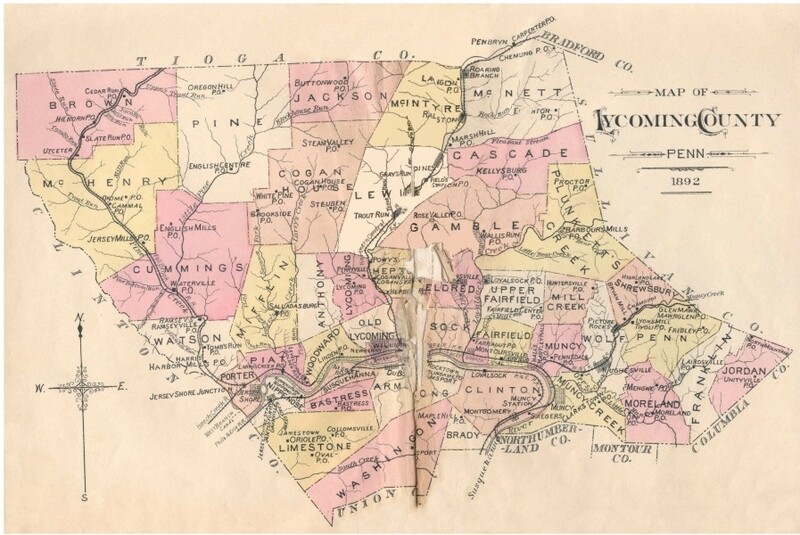 The first Pennsylvania counties were formed in 1682; county names and boundaries did not stabilize until 1878 — which means for nearly 200 years they were changing! County evolutions were compiled from information at the various PAGenWeb county sites and by using "AniMap" software from Gold Bug. Township and borough names on this page are from the 1990 Municipal Census Profiles at the Pennsylvania State Data Center. USGenWeb's collection of Pennsylvania Maps. United States Digital Map Library: Pennsylvania (online in the USGenWeb Archives). I'm told that William L. Iscrupe's book Pennsylvania Line: a Research Guide to Pennsylvania Genealogy and Local History (1990, Southwest Pennsylvania Genealogical Services, Laughlintown, PA) is a good source for county and township histories. General geographic search engines: Geographic Nameserver at MIT; GNIS (USGS Geographic Names Information System); United States Town/County Database search engine at RootsWeb.com; Global Gazetteer. Townships/Boroughs in the 1790 PA Census and what counties they later ended up in. FORMATION: 1800, from York Co. TOWNSHIPS (as of 1990): Berwick, Butler, Conewago, Cumberland, Franklin, Freedom, Germany, Hamilton, Hamiltonban, Highland, Huntington, Latimore, Liberty, Manallen, Mount Joy, Mount Pleasant, Oxford, Reading, Straban, Tyrone, Union. BOROUGHS (as of 1990): Abbottstown, Arendtsville, Bendersville, Biglerville, Bonneauville, Carroll Valley, East Berlin, Fairfield, Gettysburg, Littlestown, McSherrystown, New Oxford, York Springs. FORMATION: 1786 from Washington and Westmoreland Cos. TOWNSHIPS (as of 1990): Aleppo, Baldwin, Collier, Crescent, East Deer, Elizabeth, Fawn, Findlay, Forward, Frazer, Hampton, Harmar, Harrison, Indiana, Kennedy, Kilbuck, Leet, McCandless, Marshall, Moon, Mount Lebanon, Neville, North Fayette, North Versailles, O'Hara, Ohio, Penn Hills, Pine, Ross, Shaler, South Fayette, South Park, South Versailles, Springdale, Stowe, Upper St. Clair, West Deer, Wilkins. BOROUGHS (as of 1990): Aspinwall, Avalon, Baldwin, Bell Acres, Bellevue, Ben Avon, Ben Avon Heights, Bethel Park, Blawnox, Brackenridge, Braddock, Braddock Hills, Bradfordwoods, Brentwood, Bridgeville, Carnegie, Castle Shannon, Chalfant, Cheswick, Churchill, Clairton city, Coraopolis, Crafton, Dormont, Dravosburg, Duquesne city, East McKeesport, East Pittsburgh, Edgewood, Edgeworth, Elizabeth, Emsworth, Etna, Forest Hills, Fox Chapel, Franklin Park, Glassport, Glenfield, Green Tree, Haysville, Heidelberg, Homestead, Ingram, Jefferson, Leetsdale, Liberty, Lincoln, McDonald, McKees Rocks, Millvale, Municipality of Monroeville, Mount Oliver, Munhall, North Braddock, Oakdale, Oakmont, Osborne, Pennsbury Village, Pitcairn, Pittsburgh city, Pleasant Hills, Plum, Port Vue, Rankin, Rosslyn Farms, Sewickley, Sewickley Heights, Sewickley Hills, Sharpsburg, Springdale, Swissvale, Tarentum, Thornburg, Trafford, Turtle Creek, Verona, Versailles, Wall, West Elizabeth, West Homestead, West Mifflin, West View, Whitaker, Whitehall, White Oak, Wilkinsburg, Wilmerding. HISTORICAL: There was an Allegheny in the 1840 Census and an Allegheny City in the 1850 Census. According to the USGS GNIS, there was an historical "Allegheny" which was incorporated into the city of Pittsburg in 1907. FORMATION: 1800 from Allegheny, Lycoming, and Westmoreland. TOWNSHIPS (as of 1990): Bethel, Boggs, Bradys Bend, Burrell, Cadogan, Cowanshannock, East Franklin, Gilpin, Hovey, Kiskiminetas, Kittanning, Madison, Mahoning, Manor, North Buffalo, Parks, Perry, Pine, Plumcreek, Rayburn, Redbank, South Bend, South Buffalo, Sugarcreek, Valley, Washington, Wayne, West Franklin. BOROUGHS (as of 1990): Apollo, Applewold, Atwood, Dayton, Elderton, Ford City, Ford Cliff, Freeport, Kittanning, Leechburg, Manorville, North Apollo, Parker city, Rural Valley, South Bethleham, West Kittanning, Worthington. FORMATION: 1800 from Allegheny and Washington Cos. TOWNSHIPS (as of 1990): Brighton, Center, Chippewa, Darlington, Daugherty, Franklin, Greene, Hanover, Harmony, Hopewell, Independence, Marion, New Sewickley, North Sewickley, Patterson, Potter, Pulaski, Raccoon, Rochester, South Beaver, Vanport, White. BOROUGHS (as of 1990): Aliquippa city, Ambridge, Baden, Beaver, Beaver Falls city, Big Beaver, Bridgewater, Conway, Darlington, East Rochester, Eastvale, Economy, Ellwood City, Fallston, Frankfort Springs, Freedom, Georgetown, Glasgow, Homewood, Hookstown, Industry, Koppel, Midland, Monaca, New Brighton, New Galilee, Ohioville, Patterson Heights, Rochester, Shippingport, South Heights, West Mayfield. FORMATION: 1771 from Cumberland Co. TOWNSHIPS (as of 1990): Bedford, Bloomfield, Broad Top, Colerain, Cumberland Valley, East Providence, East St. Clair, Harrison, Hopewell, Juniata, Kimmel, King, Liberty, Lincoln, Londonderry, Mann, Monroe, Napier, Snake Spring, Southampton, South Woodbury, Union, West Providence, West St. Clair, Woodbury. BOROUGHS (as of 1990): Bedford, Coaldale, Everett, Hopewell, Hyndman, Manns Choice, New Paris, Pleasantville, Rainsburg, St. Clairsville, Saxton, Schellsburg, Woodbury. FORMATION: 1752 from Chester, Lancaster, and Philadelphia Cos. TOWNSHIPS (as of 1990): Albany, Alsace, Amity, Bern, Bethel, Brecknock, Caernarvon, Centre, Colebrookdale, Cumru, District, Douglass, Earl, Exeter, Greenwich, Heidelberg, Hereford, Jefferson, Longswamp, Lower Alsace, Lower Heidelberg, Maidencreek, Marion, Maxatawny, Muhlenberg, North Heidelberg, Oley, Ontelaunee, Penn, Perry, Pike, Richmond, Robeson, Rockland, Ruscombmanor, South Heidelberg, Spring, Tilden, Tulpehocken, Union, Upper Bern, Upper Tulpehocken, Washington, Windsor. BOROUGHS (as of 1990): Adamstown, Bally, Bechtelsville, Bernville, Birdsboro, Boyertown, Centerport, Fleetwood, Hamburg, Kenhorst, Kutztown, Laureldale, Leesport, Lenhartsville, Lyons, Mohnton, Mount Penn, Robesonia, St. Lawrence, Shillington, Shoemakersville, Sinking Spring, Strausstown, Temple, Topton, Wernersville, West Lawn, West Reading, Womelsdorf, Wyomissing, Wyomissing Hills. CITIES (as of 1990): Reading. HISTORICAL: there was a Reading Borough in the 1790 Census. FORMATION: 1846 from Bedford and Huntingdon Cos. TOWNSHIPS (as of 1990): Allegheny, Antis, Blair, Catharine, Frankstown, Freedom, Greenfield, Huston, Juniata, Logan, North Woodbury, Snyder, Taylor, Tyrone, Woodbury. BOROUGHS (as of 1990): Altoona city, Bellwood, Duncansville, Hollidaysburg, Martinsburg, Newry, Roaring Spring, Tunnelhill, Tyrone, Williamsburg. FORMATION: 1810 from Luzerne and Lycoming Cos. TOWNSHIPS (as of 1990): Albany (1824 fr Asylum), Armenia (1843 fr Troy and Canton), Asylum, Athens, Burlington (1801 fr Wysox), Canton, Columbia, Franklin, Granville, Herrick, Leroy, Litchfield, Monroe (1820 fr Towanda), North Towanda, Orwell, Overton, Pike, Ridgebury, Rome (1830 fr Sheshequin, Orwell, Wysox), Sheshequin, Smithfield, South Creek, Springfield, Standing Stone, Stevens, Terry, Towanda (1808 fr Wyalusing), Troy, Tuscarora, Ulster, Warren (1813 fr Orwell), Wells, West Burlington, Wilmot, Windham, Wyalusing (1790 fr Stoke), Wysox (1795 fr Tioga). BOROUGHS (as of 1990): Alba, Athens, Burlington, Canton, Le Raysville, Monroe, New Albany, Rome, Sayre, South Waverly, Sylvania, Towanda, Troy, Wyalusing. FORMATION: 1682 from Amerindian territory. TOWNSHIPS (as of 1990): Bedminster, Bensalem, Bridgeton, Bristol, Buckingham, Doylestown, Durham, East Rockhill, Falls, Haycock, Hilltown, Lower Makefield, Lower Southampton, Middltown, Milford, New Britain, Newtown, Nockamixon, Northampton, Plumstead, Richland, Solebury, Springfield, Tinicum, Upper Makefield, Upper Southampton, Warminster, Warrington, Warwick, West Rockhill, Wrightstown. BOROUGHS (as of 1990): Bristol, Chalfont, Doylestown, Dublin, Hulmeville, Ivyland, Langhorne, Langhorne Manor, Morrisville, New Britain, New Hope, Newtown, Penndel, Perkasie, Quakertown, Richlandtown, Riegelsville, Sellersville, Silverdale, Telford, Trumbauersville, Tullytown, Yardley. FORMATION: 1800 from Allegheny Co. TOWNSHIPS (as of 1990): Adams, Allegheny, Brady, Buffalo, Butler, Center, Cherry, Clay, Clearfield, Clinton, Concord, Connoquenessing, Cranberry, Donegal, Fairview, Forward, Franklin, Jackson, Jefferson, Lancaster, Marion, Mercer, Middlesex, Mudddy Creek, Oakland, Parker, Penn, Slippery Rock, Summit, Venango, Washington, Winfield, Worth. BOROUGHS (as of 1990): Bruin, Butler city, Callery, Cherry Valley, Chicora, Connoquenessing, East Butler, Eau Claire, Evans City, Fairview, Harmony, Harrisville, Karns City, Mars, Petrolia, Portersville, Prospect, Saxonburg, Seven Fields, Slippery Rock, Valencia, West Liberty, West Sunbury, Zelienople. FORMATION: 1804 from Bedford, Huntingdon, and Somerset Cos. TOWNSHIPS (as of 1990): Adams Allegheny, Barr, Blacklick, Cambria, Chest, Clearfield, Conemaugh, Cresson, Croyle, Dean, East Carroll, East Taylor, Elder, Gallitzin, Jackson, Lower Yoder, Middle Taylor, Munster, Portage, Reade, Richland, Stonycreek, Summerhill, Susquehanna, Upper Yoder, Washington, West Carroll, West Taylor, White. BOROUGHS (as of 1990): Ashville, Barnesboro, Brownstown, Carrolltown, Cassandra, Chest Springs, Cresson, Daisytown, Dale, East Conemaugh, Ebensburg, Ehrenfeld, Ferndale, Franklin, Gallitzin, Geistown, Hastings, Johnstown city, Lilly, Lorain, Loretto, Nanty-Glo, Patton, Portage, Sankertown, Scalp Level, South Fork, Southmont, Spangler, Summerhill, Tunnelhill, Vintondale, Westmont, Wilmore. FORMATION: 1860 from Clinton, Elk, McKean, and Potter Cos. TOWNSHIPS (as of 1990): Gibson, Grove, Lumber, Portage, Shippen. BOROUGHS (as of 1990): Driftwood, Emporium. FORMATION: 1843 from Monroe and Northampton Cos. 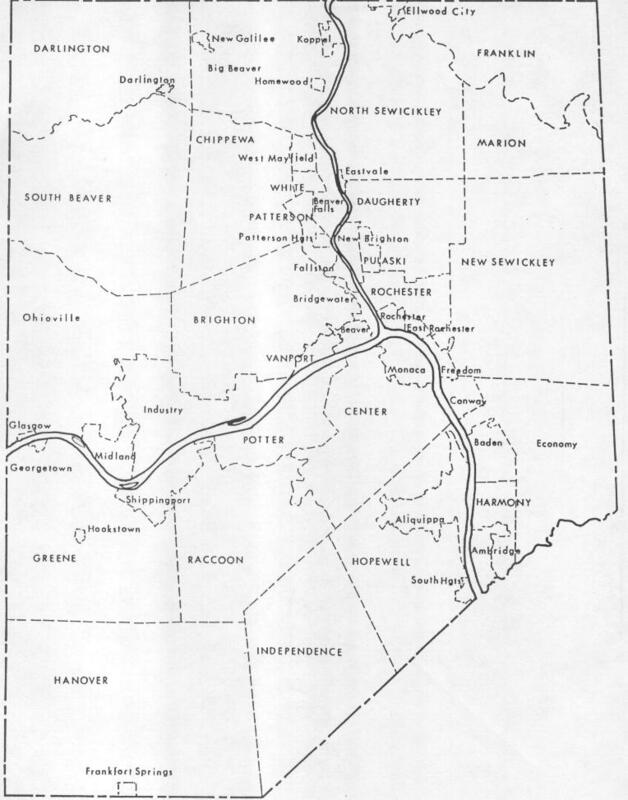 TOWNSHIPS (as of 1990): Banks, East Penn, Franklin, Kidder, Lausanne, Lehigh, Lower Towamensing, Mahoning, Packer, Penn Forest, [Upper] Towamensing. BOROUGHS (as of 1990): Beaver Meadows, Bowmanstown, East Side, Jim Thorpe, Lansford, Lehighton, Nesquehoning, Palmerton, Parryville, Summit Hill, Weatherly, Weissport. HISTORICAL: In 1840, Lower Towamensing was split off from Towamensing; afterwards, Towamensing was sometimes called "Upper Towamensing," though that is not its official name. Mauch Chunk Twp. was formed in 1827 from East Penn. Mauch Chunk was gradually whittled out of existence by the formation of boroughs: Lansford in 1876, Summit Hill in 1889, Jim Thorpe (formerly Mauch Chunk and East Mauch Chunk Boroughs) in 1954, and Nesquehoning ca. 1963, at which point Mauch Chunk became extinct. See detailed history at the link below. FORMATION: 1800 from Huntingdon, Lycoming, Mifflin, and Northumberland Cos. TOWNSHIPS (as of 1990): Benner, Boggs, Burnside, College, Curtin, Ferguson, Gregg, Haines, Halfmoon, Harris, Howard, Huston, Liberty, Marion, Miles, Patton, Penn, Potter, Rush, Snow Shoe, Spring, Taylor, Union, Walker, Worth. BOROUGHS (as of 1990): Bellefonte, Centre Hall, Howard, Milesburg, Millheim, Philipsburg, Port Matilda, Snow Shoe, South Philipsburg, State College, Unionville. TOWNSHIPS (as of 1990): Birmingham, Caln, Charlestown, East Bradford, East Brandywine, East Caln, East Coventry, East Fallowfield, East Goshen, East Marlborough, East Nantmeal, East Nottingham, East Pikeland, Easttown, East Vincent , East Whiteland, Elk, Franklin, Highland, Honey Brook, Kennett, London Britain, Londonderry, London Grove, Lower Oxford, New Garden, Newlin, New London, North Coventry, Penn, Pennsbury, Pocopson, Sadsbury, Schuylkill, South Coventry, Thornbury, Tredyffrin, Upper Oxford, Upper Uwchlan, Uwchlan, Valley, Wallace, Warwick, West Bradford, West Brandywine, West Caln, West Fallowfield, West Goshen, West Marlborough, West Nantmeal, West Nottingham, West Pikeland, West Sadsbury, Westtown, West Vincent, West Whiteland, Willistown. HISTORICAL: There is a Coventry Twp. in the 1790 Census; presumably this Coventry Twp. was later divided into the three Coventry townships above. BOROUGHS (as of 1990): Atglen, Avondale, Coatesville City, Downingtown, Elverson, Honey Brook, Kennett Square, Malvern, Modena, Oxford, Parkesburg, Phoenixville, South Coatesville, Spring City, West Chester, West Grove. FORMATION: 1839 from Armstrong and Venango Cos. TOWNSHIPS (as of 1990): Ashland, Beaver, Brady, Clarion, Elk, Farmington, Highland, Knox, Licking, Limestone, Madison, Millcreek, Monroe, Paint, Perry, Piney, Porter, Redbank, Richland, Salem, Toby, Washington. BOROUGHS (as of 1990): Callensburg, Clarion, East Brady, Emlenton, Foxburg, Hawthorn, Knox, New Bethlehem, Rimersburg, St. Petersburg, Shippenville, Sligo, Strattanville. FORMATION: 1804 from Huntingdon and Lycoming Cos. TOWNSHIPS (as of 1990): Beccaria, Bell, Bigler, Bloom, Boggs, Bradford, Brady, Burnside, Chest, Cooper, Covington, Decatur, Ferguson, Girard, Goshen, Graham, Greenwood, Gulich, Huston, Jordan, Karthaus, Knox, Lawrence, Morris, Penn, Pike, Pine, Sandy, Union, Woodward. BOROUGHS (as of 1990): Brisbin, Burnside, Chester Hill, Clearfield, Coalport, Curwensville, DuBois city, Falls Creek, Glen Hope, Grampian, Houtzdale, Irvona, Lumber City, Mahaffey, Newburg, New Washington, Osceola Mills, Ramey, Troutville, Wallaceton, Westover. FORMATION: 1839 from Centre and Lycoming Cos. TOWNSHIPS (as of 1990): Allison, Bald Eagle, Beech Creek, Castanea, Chapman, Colebrook, Crawford, Dunnstable, East Keating, Gallagher, Greene, Grugan, Lamar, Leidy, Logan, Noyes, Pine Creek, Porter, Wayne, West Keating, Woodward. BOROUGHS (as of 1990): Avis, Beech Creek, Flemington, Lock Haven city, Loganton, Mill Hall, Renovo, South Renovo. FORMATION: 1813 from Northumberland Co. TOWNSHIPS (as of 1990): Beaver, Benton, Briar Creek, Catawissa, Cleveland, Conyngham, Fishing Creek, Franklin, Greenwood, Hemlock, Jackson, Locust, Madison, Main, Mifflin, Montour, Mount Pleasant, North Centre, Orange, Pine, Roaring Creek, Scott, South Centre, Sugarloaf. BOROUGHS (as of 1990): Ashland Benton, Berwick, Bloomsburg town, Briar Creek, Catawissa, Centralia, Millville, Orangeville, Stillwater. TOWNSHIPS (as of 1990): Athens, Beaver, Bloomfield, Cambridge, Conneaut, Cussewago, East Fairfield, East Fallowfield, East Mead, Fairfield, Greenwood, Hayfield, North Shenango, Oil Creek, Pine, Randolph, Richmond, Rockdale, Rome, Sadsbury, South Shenango, Sparta, Spring, Steuben, Summerhill, Summit, Troy, Union, Venango, Vernon, Wayne, West Fallowfield, West Mead, West Shenango, Woodcock. BOROUGHS (as of 1990): Blooming Valley, Cambridge Springs, Centerville, Cochranton, Conneaut Lake, Conneautville, Hydetown, Linesville, Meadville city, Saegertown, Spartansburg, Springboro, Titusville city, Townville, Venango, Woodcock. FORMATION: 1750 from Lancaster Co. and unincorporated territory. After 1788, the only change to the county boundaries of Cumberland Co. was the loss to form Perry Co. in 1820. TOWNSHIPS (as of 1990): Cooke, Dickinson, East Pennsboro, Hampden, Hopewell, Lower Allen, Lower Frankford, Lower Mifflin, Middlesex, Monroe, North Middleton, North Newton, Penn, Shippensburg, Silver Spring, Southampton, South Middleton, South Newton, Upper Allen, Upper Frankford, Upper Mifflin, West Pennsboro. BOROUGHS (as of 1990): Camp Hill, Carlisle, Lemoyne, Mechanicsburg, Mount Holly Springs, Newburg, New Cumberland, Newville, Shippensburg, Shiremans, West Fairview, Wormleysburg. HISTORICAL: Middleton was spit into North and South in 1810; Allen into Upper and Lower in 1850; Mifflin into Upper and Lower in 1892; Frankford into Lower and Upper in 1929; Newton into North and South in 1929. FORMATION: 1785 from Lancaster Co. TOWNSHIPS (as of 1990): Conewago, Derry, East Hanover, Halifax, Jackson, Jefferson, Londonderry, Lower Paxton, Lower Swatara, Lykens, Middle Paxton, Mifflin, Reed, Rush, South Hanover, Susquehanna, Swatara, Upper Paxton, Washington, Wayne, West Hanover, Wiconisco, Williams. BOROUGHS (as of 1990): Berrysburg, Dauphin, Elizabethville, Gratz, Halifax, Harrisburg city, Highspire, Hummelstown, Lykens, Middletown, Millersburg, Paxtang, Penbrook, Pillow, Royalton, Steelton, Williamstown. FORMATION: 1789 from Chester Co. TOWNSHIPS (as of 1990): Aston, Bethel, Birmingham, Chester, Concord, Darby, Edgmont, Haverford, Lower Chichester, Marple, Middletown, Nether Providence, Newtown, Radnor, Ridley, Springfield, Thornbury, Tinicum, Upper Chichester, Upper Darby, Upper Providence. BOROUGHS (as of 1990): Aldan, Brookhaven, Chester city, Chester Heights, Clifton Heights, Collingdale, Colwyn, Darby, East Lansdowne, Eddystone, Folcroft, Glenolden, Lansdowne, Marcus Hook, Media, Millbourne, Morton, Norwood, Parkside, Prospect Park, Ridley Park, Rose Valley, Rutledge, Sharon Hill, Swarthmore, Trainer, Upland, Yeadon. FORMATION: 1843 from Clearfield, Jefferson, and McKean Cos. TOWNSHIPS (as of 1990): Benezette, Benzinger, Fox, Highland, Horton, Jay, Jones, Millstone, Ridgway, Spring Creek. BOROUGHS (as of 1990): Johnsonburg, Ridgway, St. Marys. FORMATION: 1800 from Allegheny and Crawford Cos. TOWNSHIPS (as of 1990): Amity, Concord, Conneaut, Elk Creek, Fairview, Franklin, Girard, Greene, Greenfield, Harborcreek, Lawrence Park, Le Boeuf, McKean, Millcreek, North East, Springfield, Summit, Union, Venango, Washington, Waterford, Wayne. BOROUGHS (as of 1990): Albion, Corry city, Cranesville, Edinboro, Elgin, Erie city, Fairview, Girard, Lake City, McKean, Mill Village, North East, Platea, Union City, Waterford, Wattsburg, Wesleyville. FORMATION: 1783 from Westmoreland Co. TOWNSHIPS (as of 1990): Brownsville, Bullskin, Connellsville, Dunbar, Franklin, Georges, German, Henry Clay, Jefferson, Lower Tyrone, Luzerne, Menallen, Nicholson, North Union, Perry, Redstone, Saltlick, South Union, Springfield, Springhill, Stewart, Upper Tyrone, Washington, Wharton. BOROUGHS (as of 1990): Belle Vernon, Brownsville, Connellsville city, Dawson, Dunbar, Everson, Fairchance, Fayette City, Markleysburg, Masontown, Newell, Ohiopyle, Perryopolis, Point Marion, Seven Springs, Smithfield, South Connellsville, Uniontown city, Vanderbilt. HISTORICAL: There was a Union Borough in the 1840 Census — is this now Uniontown? FORMATION: officially created in 1848 from Jefferson and Venango Cos., but not functional until 1857; gained considerably from Venango in 1865. TOWNSHIPS (as of 1990): Barnett, Green, Harmony, Hickory, Howe, Jenks, Kingsley, Tionesta. BOROUGHS (as of 1990): Tionesta. FORMATION: 1784 from Cumberland Co. TOWNSHIPS (as of 1990): Antrim, Fannett, Greene, Guilford, Hamilton, Letterkenny, Lurgan, Metal, Montgomery, Peters, Quincy, St. Thomas, Southampton, Warren, Washington. BOROUGHS (as of 1990): Chambersburg, Greencastle, Mercersburg, Mont Alto, Orrstown, Shippensburg, Waynesboro. FORMATION: 1850 from Bedford Co. TOWNSHIPS (as of 1990): Ayr, Belfast, Bethel, Brush Creek, Dublin, Licking Creek, Taylor, Thompson, Todd, Union, Wells. BOROUGHS (as of 1990): McConnellsburg, Valley-Hi. FORMATION: 1796 from Washington Co. TOWNSHIPS (as of 1990): Aleppo, Center, Cumberland, Dunkard, Franklin, Freeport, Gilmore, Gray, Greene, Jackson, Jefferson, Monongahela, Morgan, Morris, Perry, Richhill, Springhill, Washington, Wayne, Whiteley. BOROUGHS (as of 1990): Carmichaels, Clarksville, Greensboro, Jefferson, Rices Landing, Waynesburg. FORMATION: 1787 from Bedford Co. TOWNSHIPS (as of 1990): Barree, Brady, Carbon, Cass, Clay, Cromwell, Dublin, Franklin, Henderson, Hopewell, Jackson, Juniata, Lincoln, Logan, Miller, Morris, Oneida, Penn, Porter, Shirley, Smithfield, Springfield, Spruce Creek, Tell, Todd, Union, Walker, Warriors Mark, West, Wood. BOROUGHS (as of 1990): Alexandria, Birmingham, Broad Top City, Cassville, Coalont, Dudley, Huntingdon, Mapleton, Marklesburg, Mill Creek, Mount Union, Orbisonia, Petersburg, Rockhill Furnace, Saltillo, Shade Gap, Shirleysburg, Three Springs. HISTORICAL: There is a Woodberry Twp. in the 1840 Census. FORMATION: 1803 from Lycoming and Westmoreland Cos. TOWNSHIPS (as of 1990): Armstrong, Banks, Black Lick, Brush Valley, Buffington, Burrell, Canoe, Center, Cherryhill, Conemaugh, East Mahoning, East Wheatfield, Grant, Green, Montgomery, North Mahoning, Pine, Rayne, South Mahoning, Washington, West Mahoning, West Wheatfield, White, Young. BOROUGHS (as of 1990): Armagh, Blairsville, Cherry Tree, Clymer, Creekside, Ernest, Glen Campbell, Homer City, Indiana, Jacksonville, Marion Center, Plumville, Saltsburg, Shelocta, Smicksburg. FORMATION: 1804 from Lycoming Co. TOWNSHIPS (as of 1990): Barnett, Beaver, Bell, Clover, Eldred, Gaskill, Heath, Henderson, Knox, McCalmont, Oliver, Perry, Pine Creek, Polk, Porter, Ringgold, Rose, Snyder, Union, Warsaw, Washington, Winslow, Young. BOROUGHS (as of 1990): Big Run, Brockway, Brookville, Corsica, Falls Creek, Punxsutawney, Reynoldsville, Summerville, Sykesville, Timblin, Worthville. FORMATION: 1831 from Mifflin Co. From 1750 to 1789, the area that would become Juniata Co. was in Cumberland Co. From 1789 to 1831, it was in Mifflin Co. In 1831, Juniata Co. was formed from southern and eastern Mifflin Co., and its boundaries have not changed since. TOWNSHIPS (as of 1990): Beale, Delaware, Fayette, Fermanagh, Greenwood, Lack, Milford, Monroe, Spruce Hill, Susquehanna, Turbett, Tuscarora, Walker. BOROUGHS (as of 1990): Mifflin, Mifflintown, Port Royal, Thompsontown. NOTE: Greenwood Twp. was formed in 1767 in Cumberland County. The township was split in two in 1789 when Mifflin Co. was formed from Cumberland County. In 1820, Perry Co. was formed from Cumberland Co. and included Cumberland's part of Greenwood Twp. ; in 1831, Juniata Co. was formed from Mifflin Co. and included Mifflin's part of Greenwood Twp. Obviously, the two Greenwood Twps. are adjacent and are, today, on opposite sides of the Perry-Juniata county line. In 1858, Susquehanna Twp. was formed from Greenwood. FORMATION: 1870 from Luzerne Co. TOWNSHIPS (as of 1990): Abington, Benton, Carbondale, Clifton, Covington, Elmhurst, Fell, Glenburn, Greenfield, Jefferson, La Plume, Lehigh, Madison, Newton, North Abington, Ransom, Roaring Brook, Scott, South Abington, Spring Brook, West Abington. BOROUGHS (as of 1990): Archbald, Blakely, Carbondale city, Clarks Green, Clarks Summit, Dalton, Dickson City, Dunmore, Jermyn, Jessup, Mayfield, Moosic, Moscow, Old Forge, Olyphant, Scranton city, Taylor, Throop, Vandling. FORMATION: 1729 from Chester Co. TOWNSHIPS (as of 1990): Bart, Brecknock, Caernarvon, Clay, Colerain, Conestoga, Conoy, Drumore, Earl, East Cocalico, East Donegal, East Drumore, East Earl, East Hempfield, East Lampeter, Eden, Elizabeth, Ephrata, Fulton, Lancaster, Leacock, Little Britain, Manheim, Manor, Martic, Mount Joy, Paradise, Penn, Pequea, Providence, Rapho, Sadsbury, Salisbury, Strasburg, Upper Leacock, Warwick, West Cocalico, West Donegal, West Earl, West Hempfield, West Lampeter. TOWNSHIP HISTORY: There was a Cocalico Twp. in Lancaster Co. in the 1830 Census, which was presumably divided into the East and West Cocalico Twps. above. There was a Lampeter Twp. in Lancaster Co. in the 1830 Census, which was presumably divided into the East and West Lampeter Twps. above. BOROUGHS (as of 1990): Adamstown, Akron, Christiana, Columbia, Denver, East Petersburg, Elizabethtown, Ephrata, Lancaster City, Lititz, Manheim, Marietta, Millersville, Mount Joy, Mountville, New Holland, Quarryville, Strasburg, Terre Hill. HISTORICAL: there was a May Town in the 1790 Census, and the GNIS shows a Maytown in Lancaster Co. (I guess it doesn't qualify as a "borough"). FORMATION: 1849 from Beaver and Mercer Cos. TOWNSHIPS (as of 1990): Hickory, Little Beaver, Mahoning, Neshannock, New Beaver, North Beaver, Perry, Plain Grove, Pulaski, Scott, Shenango, Slippery Rock, Taylor, Union, Washington, Wayne, Wilmington. BOROUGHS (as of 1990): Bessemer, Ellport, Ellwood City, Enon Valley, New Beaver, New Castle, New Wilmington, S.N.P.J., South New Castle, Volant, Wampum. FORMATION: 1813, mostly from Dauphin Co., with a very small portion from Lancaster Co. TOWNSHIPS (as of 1990): Annville, Bethel, Cold Spring, East Hanover, Heidelberg, Jackson, Millcreek, North Annville, North Cornwall, North Lebanon, North Londonderry, South Annville, South Lebanon, South Londonderry, Swatara, Union, West Cornwall, West Lebanon. BOROUGHS (as of 1990): Cleona, Cornwall, Jonestown, City of Lebanon, Mount Gretna, Myerstown, Palmyra, Richland. For a list of townships and their formation dates, scroll to the bottom of the Home Page. FORMATION: 1812 from Northampton Co. TOWNSHIPS (as of 1990): Hanover, Heidelberg, Lower Macungie, Lower Milford, Lowhill, Lynn, North Whitehall, Salisbury, South Whitehall, Upper Macungie, Upper Milford, Upper Saucon, Washington, Weisenberg, Whitehall. TOWNSHIP HISTORY: There is a MacungieTwp. in the 1830 Census of Lehigh Co., which was presumably divided into the Upper and Lower Macungie Twps. above. BOROUGHS (as of 1990): Alburtis, Allentown City, Bethlehem City, Catasauqua, Coopersburg, Coplay, Emmaus, Fountain Hill, Macungie, Slatington. FORMATION: 1786 from Northumberland Co. TOWNSHIPS (as of 1990): Bear Creek, Black Creek, Buck, Butler, Conyngham, Dallas, Dennison, Dorrance, Exeter, Fairmount, Fairview, Foster, Franklin, Hanover, Hazle, Hollenback, Hunlock, Huntington, Jackson, Jenkins, Kingston, Lake, Lehman, Nescopeck, Newport, Pittston, Plains, Plymouth, Rice, Ross, Salem, Slocum, Sugarloaf, Union, Wilkes-Barre, Wright. BOROUGHS (as of 1990): Ashley, Avoca, Conyngham, Courtdale, Dallas, Dupont, Duryea, Edwardsville, Exeter, Forty Fort, Freeland, Harveys Lake, Hazleton city, Hughestown, Jeddo, Kingston, Laflin, Larksville, Laurel Run, Luzerne, Nanticoke city, Nescopeck, New Columbus, Nuangola, Penn Lake Park, Pittston city, Plymouth, Pringle, Shickshinny, Sugar Notch, Swoyersville, Warrior Run, West Hazleton, West Pittston, West Wyoming, White Haven, Wilkes-Barre city, Wyoming, Yatesville. FORMATION: 1795 from Northumberland Co. TOWNSHIPS (as of 1990): Anthony, Armstrong, Bastress, Brady, Brown, Cascade, Clinton, Cogan House, Cummings, Eldred, Fairfield, Franklin, Gamble, Hepburn, Jackson, Jordan, Lewis, Limestone, Loyalsock, Lycoming, McHenry, McIntyre, McNett, Mifflin, Mill Creek, Moreland, Muncy, Muncy Creek, Nippenose, Old Lycoming, Penn, Piatt, Pine, Plunketts Creek, Porter, Shrewsbury, Susquehanna, Upper Fairfield, Washington, Watson, Wolf, Woodward. BOROUGHS (as of 1990): Duboistown, Hughesville, Jersey Shore, Montgomery, Montoursville, Muncy, Picture Rocks, Salladasburg, South Williamsport, Williamsport city. TOWNSHIPS (as of 1990): Annin, Bradford, Ceres, Corydon, Eldred, Foster, Hamilton, Hamlin, Keating, Lafayette, Liberty, Norwich, Otto, Sergeant, Wetmore. BOROUGHS (as of 1990): Bradford city, Eldred, Kane, Lewis Run, Mount Jewett, Port Allegany, Smethport. HISTORICAL BOROUGHS: Kendall (see 1880 census). RESEARCH NOTES: In the 1860 census, all of Annin Twp. and the first 98 pages of Bradford Twp., are missing at both Ancestry.com and Genealogy.com. TOWNSHIPS (as of 1990): Coolspring, Deer Creek, Delaware, East Lackawannock, Fairview, Findley, French Creek, Greene, Hempfield, Jackson, Jefferson, Lackawannock, Lake, Liberty, Mill Creek, New Vernon, Otter Creek, Perry, Pine, Pymatuning, Salem, Sandy Creek, Sandy Lake, Shenango, South Pymatuning, Springfield, Sugar Grove, West Salem, Wilmington, Wolf Creek, Worth. BOROUGHS (as of 1990): Clark, Farrell city, Fredonia, Greenville, Grove City, Hermitage city, Jackson Center, Jamestown, Mercer, New Lebanon, Sandy Lake, Sharon city, Sharpsville, Sheakleyville, Stoneboro, West Middlesex, Wheatland. FORMATION: 1789 from Cumberland and Northumberland Cos. TOWNSHIPS (as of 1990): Armagh, Bratton, Brown, Decatur, Derry, Granville, Menno, Oliver, Union, Wayne. TOWNSHIPS - HISTORICAL: in 1789, in the area that would become today's (smaller) Mifflin Co., there existed just three townships: Armagh, Derry, and Wayne. Formation: Derry (1767, original county), Armagh (1770 from Derry), Wayne (1782 from Derry), Union (1790 from Armagh), Decatur (1813 from Derry), Oliver (1835 from Wayne), Brown (1837 from Armagh), Menno (1837 from Union), Granville (1838 from Oliver? ), Bratton (1859 from Oliver). BOROUGHS (as of 1990): Burnham, Juniata Terrace, Kistler, Lewistown, McVeytown. FORMATION: 1836 from Northampton and Pike Cos. TOWNSHIPS (as of 1990): Barrett, Chestnuthill, Coolbaugh, Eldred, Hamilton, Jackson, Middle Smithfield, Paradise, Pocono, Polk, Price, Ross, Smithfield, Stroud, Tobyhanna, Tunkhannock. TOWNSHIP HISTORY: There is a Lower Smithfield in the 1790 and 1810 Censuses of Northampton Co., which is presumably the Smithfield Twp. now in Monroe Co. — there are presently no other Smithfield Twps. in Northampton or counties derived from it. BOROUGHS (as of 1990): Delaware Water Gap, East Stroudsburg, Mount Pocono, Stroudsburg. FORMATION: 1784 from Philadelphia Co. TOWNSHIPS (as of 1990): Abington, Cheltenham, Douglass, East Norriton, Franconia, Hatfield, Horsham, Limerick, Lower Frederick, Lower Gwynedd, Lower Merion, Lower Moreland, Lower Pottsgrove, Lower Providence, Lower Salford, Marlborough, Montgomery, New Hanover, Perkiomen, Plymouth, Salford, Skippack, Springfield, Towamencin, Upper Dublin, Upper Frederick, Upper Gwynedd, Upper Hanover, Upper Merion, Upper Moreland, Upper Pottsgrove, Upper Providence, Upper Salford, West Norriton, West Pottsgrove, Whitemarsh, Whitpain, Worcester. BOROUGHS (as of 1990): Ambler, Bridgeport, Bryn Athyn, Collegeville, Conshohocken, East Greenville, Green Lane, Hatboro, Hatfield, Jenkintown, Lansdale, Narberth, Norristown, North Wales, Pennsburg, Pottstown, Red Hill, Rockledge, Royersford, Schwenksville, Souderton, Telford, Trappe, West Conshohocken. HISTORICAL: There was a Gwynedd Twp. in the 1850 Census, which was presumably later divided into Upper and Lower Gwynedd Twps. FORMATION: 1850 from Columbia Co. TOWNSHIPS (as of 1990): Anthony, Cooper, Derry, Liberty, Limestone, Mahoning, Mayberry, Valley, West Hemlock. BOROUGHS (as of 1990): Danville, Washingtonville. FORMATION: 1752 from Bucks Co. TOWNSHIPS (as of 1990): Allen, Bethlehem, Bushkill, East Allen, Forks, Hanover, Lehigh, Lower Mount Bethel, Lower Nazareth, Lower Saucon, Moore, Palmer, Plainfield, Upper Mount Bethel, Upper Nazareth, Washington, Williams. BOROUGHS (as of 1990): Bangor, Bath, Bethlehem city, Chapman, East Bangor, Easton city, Freemansburg, Glendon, Hellertown, Nazareth, Northampton, North Catasauqua, Pen Argyl, Portland, Roseto, Stockertown, Tatamy, Walnutport, West Easton, Wilson, Wind Gap. HISTORICAL: There is a "Bushkill Ward Boro" in the 1840 Census. FORMATON: 1772 from Bedford, Berks, Cumberland, Lancaster, and Northampton Cos. TOWNSHIPS (as of 1990): Coal, Delaware, East Cameron, East Chillisquaque, Jackson, Jordan, Lewis, Little Mahanoy, Lower Augusta, Lower Mahanoy, Mount Carmel, Point, Ralpho, Rockefeller, Rush, Shamokin, Turbot, Upper Augusta, Upper Mahanoy, Washington, West Cameron, West Chillisquaque, Zerbe. In the 1830 Census, there was an Augusta Twp. in Northumberland Co. Presumably, this township was later divided into the Upper and Lower Augusta Twps. above. Ditto Chillisquaque, into East and West sections, which also occurs in the 1840 Census. BOROUGHS (as of 1990): Herndon, Kulpmont, McEwensville, Marion Heights, Milton, Mount Carmel, Northumberland, Riverside, Shamokin City, Snydertown, Sunbury City, Turbotville, Watsontown. REFERENCE: Herbert C. Bell. 1891. History of Northumberland County... Brown, Runk & Co., Chicago. Detailed evolution of county and townships, with a series of historical maps. Text of book online at the PAGenWeb Northumberland Co. web site. FORMATION: 1820 from Cumberland Co. The region that would become Perry Co. was Amerindian territory prior to a treaty in 1754 that annexed the region into Cumberland Co. In 1820, Perry Co. was formed from seven Cumberland Co. townships, namely: Buffalo, Greenwood, Juniata, Rye, Saville, Tyrone, and Toboyne. TOWNSHIPS (as of 1990): Buffalo, Carroll, Centre, Greenwood, Howe, Jackson, Juniata, Liverpool, Miller, Northeast Madison, Oliver, Penn, Rye, Saville, Southwest Madison, Spring, Toboyne, Tuscarora, Tyrone, Watts, Wheatfield. HISTORICAL: There is a Madison Twp. in the 1840 and 1850 Censuses that was presumably later split into Northeast Madison and Southwest Madison. BOROUGHS (as of 1990): Blain, Bloomfield, Duncannon, Landisburg, Liverpool, Marysville, Millerstown, New Buffalo, Newport. NOTE: Greenwood Twp. was formed in 1767 in Cumberland County. The township was split in two in 1789 when Mifflin Co. was formed from Cumberland County. In 1820, Perry Co. was formed from Cumberland Co. and included Cumberland's part of Greenwood Twp. ; in 1823, Liverpool Twp. was formed from Greenwood. In 1831, Juniata Co. was formed from Mifflin Co. and included Mifflin's part of Greenwood Twp. Obviously, the two Greenwood Twps. are adjacent and are, today, on opposite sides of the Perry-Juniata county line. TOWNSHIPS (as of 1990, according to the Pennsylvania State Data Center): none. BOROUGHS (as of 1990, according to the Pennsylvania State Data Center): Philadelphia city. BOROUGHS (as found in early censuses): Aramingo, East Northern Liberties, Germantown, High Street Ward, Kensington District, Lower Delaware Ward, North Mulberry Ward, Northern Liberties, Passyunk, Roxborough, Spring Garden, West Northern Liberties. FORMATION: 1814 from Wayne Co. TOWNSHIPS (as of 1990): Blooming Grove, Delaware, Dingman, Greene, Lackawaxen, Lehman, Milford, Palmyra, Porter, Shohola, Westfall. BOROUGHS (as of 1990): Matamoras, Milford. TOWNSHIPS (as of 1990): Abbott, Allegany, Bingham, Clara, Eulalia, Genesee, Harrison, Hebron, Hector, Homer, Keating, Oswayo, Pike, Pleasant Valley, Portage, Roulette, Sharon, Stewardson, Summit, Sweden, Sylvania, Ulysses, West Branch, Wharton. BOROUGHS (as of 1990): Austin, Coudersport, East Fork district, Galeton, Oswayo, Shinglehouse, Ulysses. FORMATION: 1811 from Berks and Northampton Cos. From 1752 to 1811, the area that would become Schuylkill Co. was in northern Berks and northwestern Northampton Cos. 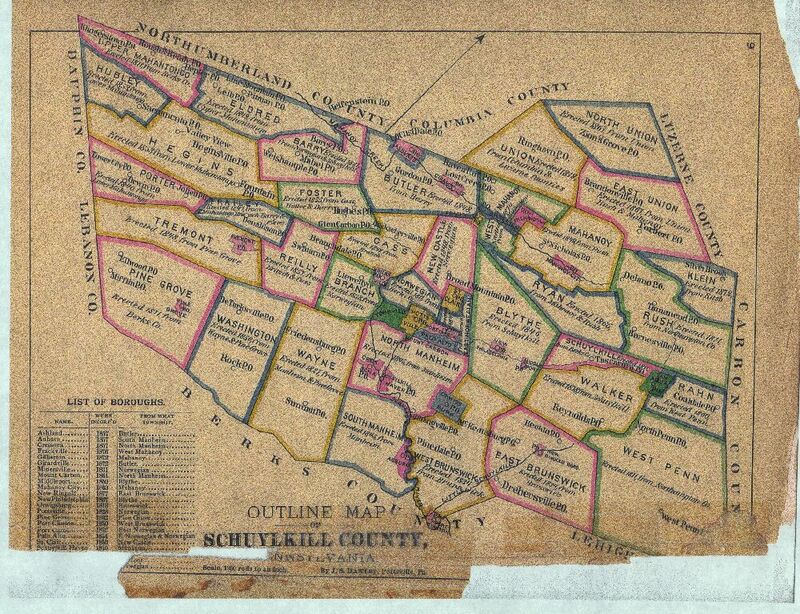 In 1811, Schuylkill Co. was formed; and, in 1818, it expanded northward at the expense of Columbia and Luzerne Cos. The boundaries of the county have not changed since 1818. TOWNSHIPS as of 1990 (formation dates): Barry (1821), Blythe (1846), Branch (1836), Butler (1848), Cass (1848), Delano (1882), East Brunswick (1834), East Norwegian (1840), East Union (1867), Eldred (1848), Foster (1855), Frailey (1847), Hegins (1853), Hubley (1853), Kline (1873), Mahanoy (1849), New Castle (1847), North Manheim (1845), North Union (1867), Norwegian (1811), Pine Grove (1811), Porter (1840), Reilly (1856), Rush (1811), Ryan (1868), Schuylkill (1811), South Manheim (1845), Tremont (1847), Union (1811), Upper Mahantango (1811), Walker (1878), Washington (1856), Wayne (1827), West Brunswick (1827), West Mahanoy (1874), West Penn (1811). TOWNSHIP HISTORY: Lower Mahantango Twp. is mentioned in early censuses, but in 1853, it was divided into Hegins Twp. and Hubley Twp., at which point Lower Mahantango ceased to exist. BOROUGHS as of 1990: Ashland, Auburn, Coaldale, Cressona, Deer Lake, Frackville, Gilberton, Girardville, Gordon. Landingville, McAdoo, Mahanoy City, Mechanicsville, Middleport, Minersville, Mount Carbon, New Philadelphia, New Ringgold, Orwigsburg, Palo Alto, Pine Grove, Port Carbon, Port Clinton, Pottsville, Ringtown, St. Clair, Schuylkill Haven, Shenandoah, Tamaqua, Tower City, Tremont. FORMATION: 1855 from southern Union Co. It's boundaries have not changed since. TOWNSHIPS as of 1990 (formation dates): Adams (1874), Beaver (1787), Center (1805), Chapman (1820), Franklin (1853), Jackson (1854), Middlecreek (1838), Monroe (1856), Penn [historically Penns/Penn's] (1758), Perry (1816), Spring (1885), Union (1869), Washington (1818), West Beaver (1843), West Perry (1858). 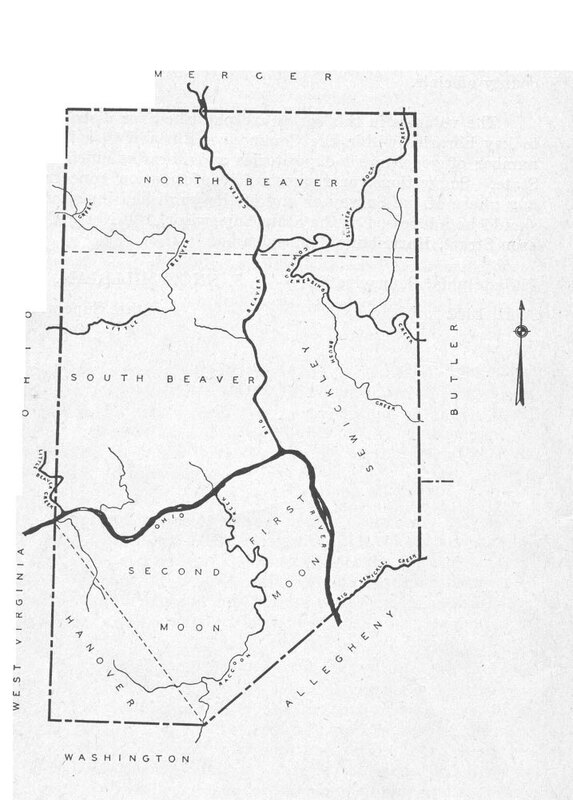 EXTINCT TOWNSHIP (Bell 1891): Mahantango Twp. was formed in 1795 from Penn's Twp. In 1816, Mahantango Twp. ceded land to Perry Twp. and, in 1818, to Washington Twp., at which point Mahantango Twp. ceased to exist. Perry and Washington Twps. were further subdivided to form West Perry, Chapman, and Union Twps. These were among the townships ceded by Union Co. to form Snyder Co. in 1855. Therefore, inhabitants shown living in "Mahantango Twp., Northumberland Co." in the 1800 or 1810 censuses were actually living in what later became south-central and southeastern Snyder Co. BOROUGHS as of 1990: Beavertown, Freeburg, McClure, Middleburg, Selinsgrove, Shamokin Dam. FORMATION: 1795 from Bedford Co. TOWNSHIPS (as of 1990): Addison, Allegheny, Black, Brothersvalley, Conemaugh, Elk Lick, Fairhope, Greenville, Jefferson, Jenner, Larimer, Lincoln, Lower Turkeyfoot, Middlecreek, Milford, Northampton, Egle, Paint, Quemahoning, Shade, Somerset, Southampton, Stonycreek, Summit, Upper Turkeyfoot. BOROUGHS (as of 1990): Addison, Benson, Berlin, Boswell, Callimont, Casselman, Central City, Confluence, Garrett, Hooversville, Indian Lake, Jennerstown, Meyersdale, New Baltimore, New Centerville, Paint, Rockwood, Salisbury, Seven Springs, Shanksville, Somerset, Stoystown, Ursina, Wellersburg, Windber. CITIES/TOWNS/VILLAGES (according to GNIS): Acosta, Addison, Allenvale, Althouse, Ankeny, Ashtola, Bakersville, Barronvale, Beachdale, Beachly, Bens Creek, Benson, Berkleys Mill, Berlin, Bittners Mill, Blackfield, Blough, Boone, Boswell, Boynton, Brotherton, Buckstown, Burkhelder, Cairnbrook, Callimont, Casselman, Central City, Coal Junction, Coal Run, Coleman, Comps Crossroads, Compton, Confluence, Crumb, Daley, Davidsville, Downey, Draketown, Dumas, Edie, Engles Mill, Enoch, Fairhope, Fairview, Ferrellton, Foley, Fort Hill, Forward, Forwardstown, Foustwell, Friedens, Gahagen, Garrett, Gebhart, Geiger, Gideon, Glade, Glade City, Glen Savage, Glencoe, Glessner, Goodtown, Gray, Hagero, Harnedsville, Hays Mill, Hillsboro, Hollsopple, Hooversville, Humbert, Husband, Huston, Indian Lake, Indiantown, Jenners, Jenners Crossroads, Jennerstown, Jerome, Jerome Junction, Jimtown, Johnsburg, Kantner, Kennells Mill, Keystone, Kimmel, Kimmelton, Kingwood, Klines Mill, Krings, Lambertsville, Landstreet, Laurel Falls, Laurel Mountain Village, Laurel Summit, Lavansville, Listie, Listonburg, Macdonaldton, Mance Maple Ridge, Markleton, Meadowdale, Metzler, Meyersdale, Milford, Mineral Spring, Mostoller, Murdock, New Baltimore, New Centerville, New Lexington, Niver Junction, Niverton, Ogletown, Old Shade Furnace, Paddytown, Paint, Philson, Pilltown, Pine Hill, Pinkerton, Pleasant Union, Pocahontas, Quecreek, Ralphton, Randolph, Reading Number Three, Reels Corners, Reitz, Roberts, Rockwood, Rockwood Station, Romania, Rowena, Roxbury, Roytown, Rummel, Saint Paul, Salco, Salisbury, Salisbury Junction, Sand Patch, Savage, Schweibinzville, Scullton, Seanor, Seven Springs, Shaft, Shamrock, Shanksville, Shaw Mines, Shober, Sipesville, Slabtown, Snydersville, Somerfield, Somerset, Springs, Stoystown, Summit Mills, Sylvan Lane, Thomas Mill, Thomasdale, Tire Hill, Trent, Unamis, Ursina, Warrens Mill, Wellersburg, Wells Creek, West Meyersdale, West Salisbury, Wilbur, Williams, Wilson Creek, Windber, Wittenberg, Zimmerman. FORMATION: 1847 from Lycoming Co. TOWNSHIPS (as of 1990): Cherry, Colley, Davidson, Elkland, Forks, Fox, Hillsgrove, Laporte, Shrewsbury. BOROUGHS (as of 1990): Dushore, Eagles Mere, Forksville, Laporte. FORMATION: 1810 from Luzerne Co. TOWNSHIPS (as of 1990): Apolacon, Ararat, Auburn, Bridgewater, Brooklyn, Choconut, Clifford, Dimock, Forest Lake, Franklin, Gibson, Great Bend, Harford, Harmony, Herrick, Jackson, Jessup, Lathrop, Lenox, Liberty, Middletown, New Milford, Oakland, Rush, Silver Lake, Springville, Thompson. BOROUGHS (as of 1990): Forest City, Friendsville, Great Bend, Hallstead, Hop Bottom, Lanesboro, Little Meadows, Montrose, New Milford, Oakland, Susquehanna Depot, Thompson, Union Dale. HISTORICAL NOTE: Brooklyn Twp. was known as Waterford Twp. until the name changed in 1825. TOWNSHIPS (as of 1990): Bloss, Brookfield, Charleston, Chatham, Clymer, Covington, Deerfield, Delmar, Duncan, Elk, Elkland, Farmington, Gaines, Hamilton, Jackson, Lawrence, Liberty, Middlebury, Morris, Nelson, Osceola, Putnam, Richmond, Rutland, Shippen, Sullivan, Tioga, Union, Ward, Westfield. BOROUGHS (as of 1990): Blossburg, Elkland, Knoxville, Lawrenceville, Liberty, Mansfield, Roseville, Tioga, Wellsboro, Westfield. FORMATION: 1813 from Northumberland. From 1771 to 1813, the region that would become Union Co. was in Northumberland Co. In 1813, Union Co. was formed from western Northumberland Co. The county experienced several minor boundary changes between 1815 and 1820, then the boundaries remained unchanged until 1855 when Snyder Co. was formed from the southern half of Union Co. There were minor boundary changes in 1861 and 1868, but, since 1868, the county boundaries have remained unchanged. TOWNSHIPS (as of 1990): Buffalo, East Buffalo, Gregg, Hartley, Kelly, Lewis, Limestone, Union, West Buffalo, White Deer. TOWNSHIP HISTORY: There is a New Columbia Twp. in Union Co. in the 1830 Census; today, New Columbia is a town on the Susquehanna River in Union Co. BOROUGHS (as of 1990): Hartleton, Lewisburg, Mifflinburg, New Berlin. FORMATION: 1800 from Allegheny, Crawford, and Lycoming Cos. TOWNSHIPS (as of 1990): Allegheny, Canal, Cherrytree, Clinton, Cornplanter, Cranberry, Frenchcreek, Irwin, Jackson, Mineral, Oakland, Oilcreek, Pinegrove, Plum, President, Richland, Rockland, Sandycreek, Scrubgrass, Victory. BOROUGHS (as of 1990): Barkeyville, Clintonville, Cooperstown, Emlenton, Franklin city, Oil City city, Pleasantville, Polk, Rouseville, Sugarcreek, Utica. FORMATION: 1800 from Allegheny, Crawford, Lycoming, and Venango Cos. TOWNSHIPS (as of 1990): Brokenstraw, Cherry Grove, Columbus, Conewango, Deerfield, Eldred, Elk, Farmington, Freehold, Glade, Limestone, Mead, Pine Grove, Pittsfield, Pleasant, Sheffield, Southwest, Spring Creek, Sugar Grove, Triumph, Watson. BOROUGHS (as of 1990): Bear Lake, Clarendon, Sugar Grove, Tidioute, Warren city, Youngsville. FORMATION: 1781 from Westmoreland Co. TOWNSHIPS (as of 1990): Amwell, Blaine, Buffalo, Canton, Carroll, Cecil, Chartiers, Cross Creek, Donegal, East Bethlehem, East Finley, Fallowfield, Hanover, Hopewell, Independence, Jefferson, Morris, Mount Pleasant, North Bethlehem, North Franklin, North Strabane, Nottingham, Peers, Robinson, Smith, Somerset, South Franklin, South Strabane, Union, West Bethlehem, West Finley, West Pike Run. HISTORICAL: There was an East Pike Run in the 1840 Census. BOROUGHS (as of 1990): Allenport, Beallsville, Bentleyville, Burgettstown, California, Canonsburg, Centerville, Charleroi, Claysville, Coal Center, Cokeburg, Deemston, Donora, Dunlevy, East Washington, Elco, Ellsworth, Finleyville, Green Hills, Houston, Long Branch, McDonald, Marianna, Midway, Monongahela city, New Eagle, North Charleroi, Roscoe, Speers, Stockdale, Twilight, Washington city, West Alexander, West Brownsville, West Middletown. FORMATION: 1798 from Northampton Co. TOWNSHIPS (as of 1990): Berlin, Buckingham, Canaan, Cherry Ridge, Clinton, Damascus, Dreher, Dyberry, Lake, Lebanon, Lehigh, Manchester, Mount Pleasant, Oregon, Palmyra, Paupack, Preston, Salem, Scott, South Canaan, Sterling, Texas. BOROUGHS (as of 1990): Bethany, Hawley, Honesdale, Prompton, Starrucca, Waymart. FORMATION: 1773 from Bedford Co. TOWNSHIPS (as of 1990): Allegheny, Bell, Cook, Derry, Donegal, East Huntingdon, Fairfield, Hempfield, Ligonier, Loyalhanna, Mount Pleasant, North Huntingdon, Penn, Rostraver, St. Clair, Salem, Sewickley, South Huntingdon, Unity, Upper Burrell, Washington. BOROUGHS (as of 1990): Adamsburg, Arnold city, Arona, Avonmore, Bolivar, Delmont, Derry, Donegal, East Vandergrift, Export, Hunker, Hyde Park, Irwin, Jeannette city, Latrobe, Laurel Mountain, Ligonier, Lower Burnell city, Madison, Manor, Monessen city, Mount Pleasant, Municipality of Murrysville, New Alexandria, New Florence, New Kensington city, New Stanton, North Belle Vernon, North Irwin, Oklahoma, Penn, Scottdale, Seward, Smithton, South Greensburg, Southwest Greensburg, Sutersville, Trafford, Vandergrift, West Leechburg, West Newton, Youngstown, Youngwood. FORMATION: 1842 from Luzerne Co. TOWNSHIPS (as of 1990): Braintrim, Clinton, Eaton, Exeter, Falls, Forkston, Lemon, Mehoopany, Meshoppen, Monroe, Nicholson, North Branch, Northmoreland, Noxen, Overfield, Tunkhannock, Washington, Windham. BOROUGHS (as of 1990): Factoryville, Laceyville, Meshoppen, Nicholson, Tunkhannock. FORMATION: 1749 from Lancaster Co. TOWNSHIPS (as of 1990): Carroll, Chanceford, Codorus, Conewago, Dover, East Hopewell, East Manchester, Fairview, Fawn, Franklin, Heidelberg, Hallam/Hellam, Hopewell, Jackson, Lower Chanceford, Lower Windsor, Manchester, Manheim, Monaghan, Newberry, North Codorus, North Hopewell, Paradise, Peach Bottom, Penn, Shrewsbury, Springettsbury, Springfield, Spring Garden, Warrington, Washington, West Manchester, West Manheim, Windsor, York. BOROUGHS (as of 1990): Cross Roads, Dallastown, Delta, Dillsburg, Dover, East Prospect, Fawn Grove, Felton, Franklintown, Glen Rock, Goldsboro, Hallam/Hellam, Hanover, Jacobus, Jefferson, Lewisberry, Loganville, Manchester, Mount Wolf, New Freedom, New Salem, North York, Railroad, Red Lion, Seven Valleys, Shrewsbury, Spring Grove, Stewartstown, Winterstown, Wrightsville, Yoe, York city, Yorkana, York Haven.